Stockholm facts - good to know before your trip - tourist information. Here are some different facts about Stockholm and good things to know before your visit. nearly 1.4 million in Greater Stockholm. Otherwise, approximately 850 000. Where is the capital of Sweden situated? Stockholm is located on the East Coast and is situated on the islands in Lake Mälaren near the Baltic Sea. Stockholm is mentioned as early as the 1200s. And said to have received its city papers on May 1, 1436 and after that Stockholm becomes the capital of Sweden. But not until 1634, the entire government moved to Stockholm from other parts of Sweden. Arlanda Airport - the airport is about 40 kilometer from Stockholm. Bromma Airport - the airport is about 10 km from Stockholm city center. Skavsta Airport - (Nyköping) about 110 km from Stockholm. Västerås Airport - (Västerås) about 100 km from Stockholm. There are different ways to get from the Stockholm airports to the city centre. From Arlanda you go quick and easy with the Arlanda Express to Stockholm Central. From all airports you can go by both buses and private transfers. If you want to now what is going on in Stockholm during your visit or want a map or just want to ask something, visit the tourist information. 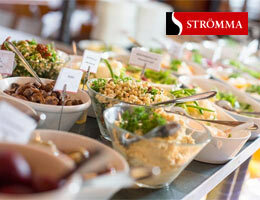 Enjoy a nice brunch buffet while crusing the lovely archipelago. A cozy weekend trip.